Roy Harper has been given the focus in the first parts of this Titans story arc. This time around, it’s Donna Troy who gets the spotlight, at least so far as the Titans go. 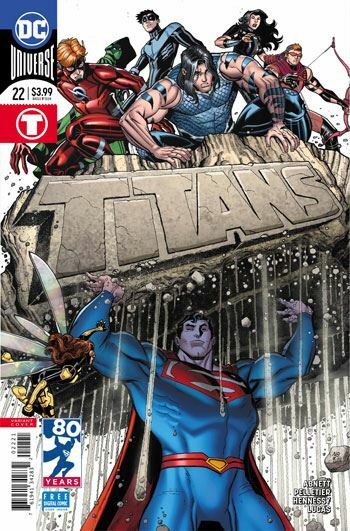 Though the cover does not hint at it, the Justice League play a large role in the story. The first half of the issue pretty much belongs to them. The Leaguers do not believe Donna Troy, when she insists that Roy Harper’s information about the Brain’s big mind control plan is true. But they wind up going into action to deal with a number of seemingly natural disasters taking place, all a part of the evil scheme. I am still irked that Dan Abnett has dropped Monsieur Mallah’s French accent, but he does get the characterization right. The fears Mallah has, that his odd relationship with the Brain will come to an end if the villain succeeds at his plot, not only make the talking ape more sympathetic, it also lays the groundwork for his betrayal. I’m only guessing at that, but it seems pretty clearly laid out. Paul Pelletier and Andrew Hennessy deliver some really dynamic art. The fight scenes look great, and I particularly love the close ups of Mallah and the Brain. It’s not too easy to make a jar look threatening, but it sure does here. All in all a fun chapter, building to an effective climax. I am definitely looking forward to the next issue.